This training course is perfect for those seeking an alternate revenue stream, creating a new business, enhancing current skills, or satisfying curiosity of the true need for these services to the mortgage companies. NOTE: This course is not affiliated with any specific vendor company, but is supported and endorsed by several companies seeking to hire knowledgeable and qualified individuals. Completing this course is the first step! Although some National and Regional companies hire employees to conduct field inspections, the majority of mortgage field service inspectors are Independent Contractors (earn 1099 wages). Field Service companies across the nation send potential property inspectors here to gain a solid understanding of the principles of the Mortgage Field Services industry. Inspection companies know that those who complete this course have the knowledge and general understanding of the industry and how to complete property inspections. 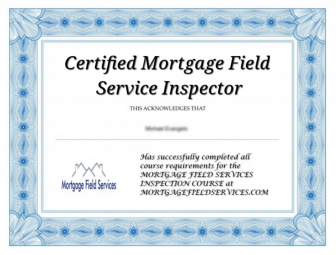 If you were sent here by a hiring company or directed to come here from one of your clients, upon successfully completing the course you will be able to print off your certification as a Certified Mortgage Field Service Inspector. If you responded to a job ad and live in TX, OK, AR, LA, FL, MS, AL or GA, you will see an application at the end of the course that will be sent to several hiring companies. You must pass the course in order to see the application. If you found this training course by using a search engine, Thank you. Have you ever heard of the mortgage field services industry? Well, it has been around for as long as people have been purchasing homes via mortgage loans. By law, whenever a mortgaged property goes more than 45 days behind in the mortgage payment, the mortgage company is required to generate a work order to send a property inspector to the address to determine if the property is either occupied or vacant, and the general condition of the property. On average, it takes about 5 to 10 minutes to complete each work order inspection. Fees are paid per work order. Areas of assignment are given to each inspector, usually a county. Using your own cell phone, there are 6 core photos involved; Front, Address, Neighborhood, Street Sign and Two Occupancy Indicator photos. Some work orders require you to take a photo of a letter you leave in the crack of the door. If vacant, you take additional photos of all four sides, the utilities to help prove that the property is vacant. Some clients require you to take photos of the interior after gaining entrance using a key found in a lockbox on one of the doors at the property. Certain clients require you to purchase a set of keys that will allow you to gain entry to vacant properties. No money collections or financial inquiries of any sort are involved. This is NOT debt collection, this is property inspection. This is NOT how to become a Home Inspector. That is a different industry which requires a license. These are Mortgage Property Inspections. At the end of this online course you will know how to conduct property inspections and will be Certified as a Mortgage Field Service Property Inspector. This training course is considered a 3rd party course and is not owned by any of the companies who created the job ad that sent you here. However, they may have made this course mandatory to be hired as one of their vendors. They know that once you pass this course you will be certified to complete property inspections. It will make you eligible to work for a number of Regional companies in your geographic area, and can be selected as an accolade if you advertise your services on the FieldServiceDirectory.com website. Enjoy the course, learn a new trade, teach yourself how to make more money as a career or part-time. The situation is that hiring companies hire you as an Independent Contractor, not as an employee. You are your own company. As an Independent Contractor you are a business and can deduct anything that is required to conduct your business. Mileage, cell phones, internet, printer, ink, paper, your home office, are all items that you can deduct from your taxes just as any other business can deduct. Training however, is only provided to “employees”. As an Independent Contractor you should already know how to conduct property inspections. So how are you going to start this business without knowing how to do it? That is where this free course for Independent Contractors comes in. Several business owners got together to provide the subject matter of this course, so that you can learn how to conduct inspections properly. Of course there is a donation suggestion at the end of the course to help pay for server costs and programming fees, that’s it. Enjoy the course!